After researching the web for quite a while I finally bought a new multifunction printer for my girlfriend. It is a HP photosmart C7280. My girlfriend has a Mac and all my computers run Linux and I have one Windows installation for games, so Linux and Mac support was crucial. The main reason to by a new printer was to be able to make copies and scan documents, so a new printer would have to be a All-In-One (AIO) printer. Since my last printer had two-sided printing (duplex) I couldn’t go back to a printer with out this option. Even though I have a server that also runs a CUPS server it would be nice if the printer had built-in network capabilities. I knew from www.linuxfoundation.org that both Brother and HP are well supported under Linux but I had my doubts about being able to make the scanning part work. 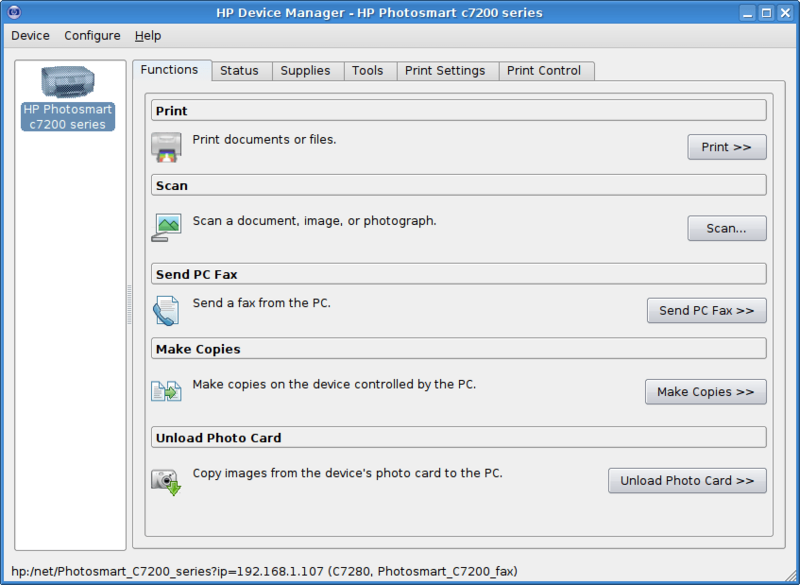 HP has Linux drivers for most of it’s printers which is available on hplip.sourceforge.net and after it appeared that HP was the best supported option especially when considering the scanning part. The unit came with a installation CD which contained both Mac and Windows drivers and even though the programs for both were quite bloated and large they worked with out a hitch. When it came to the Linux installation I thought that I need to download all sorts of files but it turned out that hplip (the driver and frontend) is included in a standard Ubuntu installation. In fact the installation on the Linux machine was by far the easiest. I didn’t have to install anything and it was working straight away. I have no problems scanning, printing, copying, checking ink levels, cleaning the printer from the Linux interface. I find this kind of Linux support remarkable and if I worked at HP I would put a big stamp on the box saying “Great Linux supported”. The only problem with this printer is that ink-cartridges are a bit expensive. If one needs all the color cartridges the cheapest thing is to by a HP Q7966EE Photo Pack 363, which contains all 6 colors and 150 sheets of glossy photo paper. But if only more black ink is needed the larger HPC8719EE 17ml cartridge is around 60% cheaper in ink costs than the 6 ml HPC8721EE cartridge. I recently found some non-original cartridges which were about 50% cheaper but voids the warranty so I am not sure I will be buying them. Most ink-jet-based all-in-ones (AIOs) emphasize either photo-related or office-centric features. The former are best suited for a home, while the latter work well for a small office or home office. The HP Photosmart C7280 All-In-One is strong in both departments. It offers photo-friendly features and high-quality photo prints, and also sports an automatic document feeder (ADF), standalone and fax, network connector, and Wi-Fi capability, all features that any office would welcome. All these capabilities make it a great choice for the dual role of home and home-office AIO. 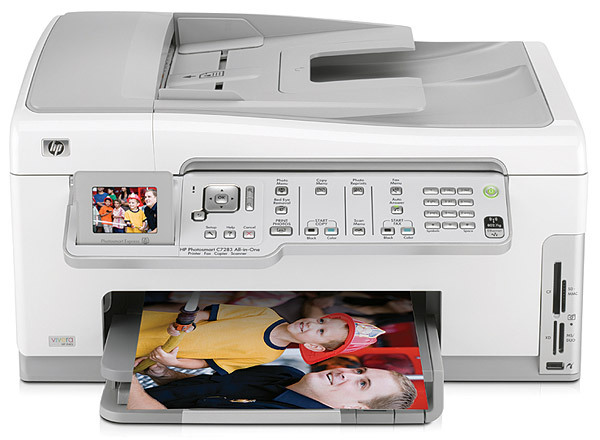 The Photosmart C7280 looks good, prints quite fast and has many useful features – though no direct CD/DVD print. It costs a bit to run, though, and print quality is variable, depending on the document type. There was a false alarm on the pricing, where Laskys appeared to be offering the device for £130. At that price, it would be very good value. At the ‘real’ price of around £200, it’s a bit expensive compared with its rivals. You can purchase multifunction printers that are less expensive than the Photosmart C7280, but it would be hard to find an all-in-one that has such a rich and well-balanced set of features. If you’re looking for a multifunction device that produces the best possible photo scans and photo prints, the C7280 might not be your best choice; but if you are looking for a printer/copier/scanner/fax machine with very good overall print quality, flexible connectivity, and strong standalone functionality, the C7280 can be a great addition to the home or small office. Nice review. Perhaps you could post a few pictures showing the print quality? I have been visiting this blog for some time now, i have just subscribed to your RSS so i can i get updates on a regular basis. Keep up the good work!